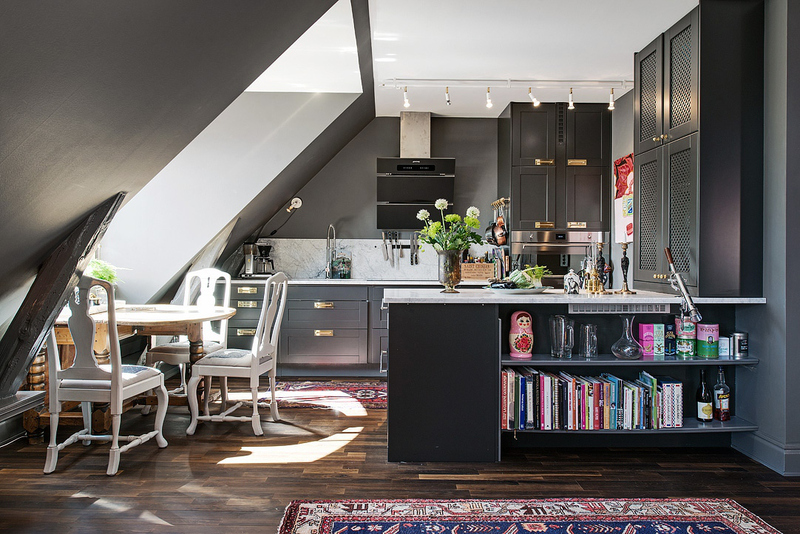 A loft kitchen, on the top floor of a 19th century apartment building in Sweden, is a dark dazzler. 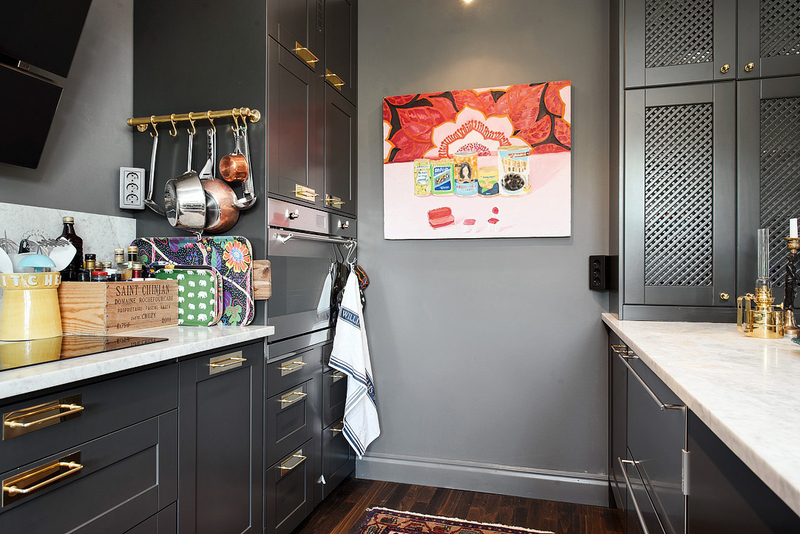 This small compact kitchen combines economies of space often required in apartments with dramatic dark gray walls and cabinets that help it seamlessly blend into the adjacent living space — and enhance it. 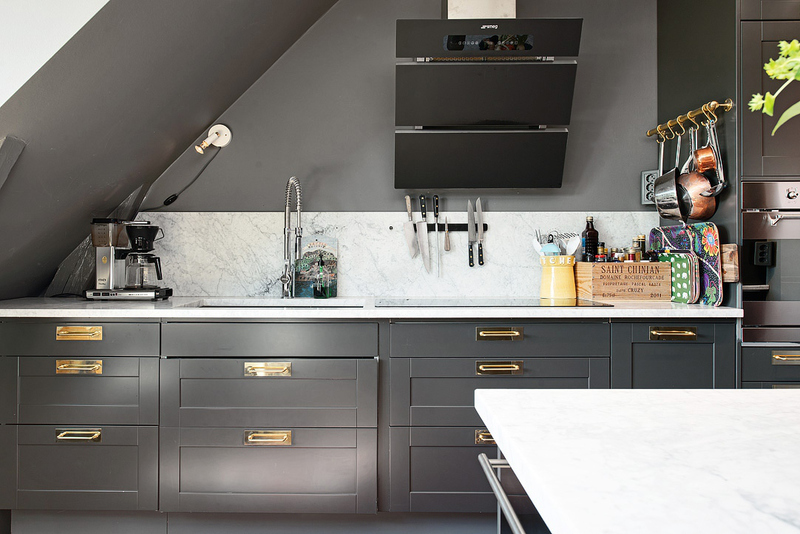 The kitchen’s palette offers no color — cabinets are plated slate gray, satin black with white marble counters and backsplash. And as kitchens go, this one is dark — very dark. 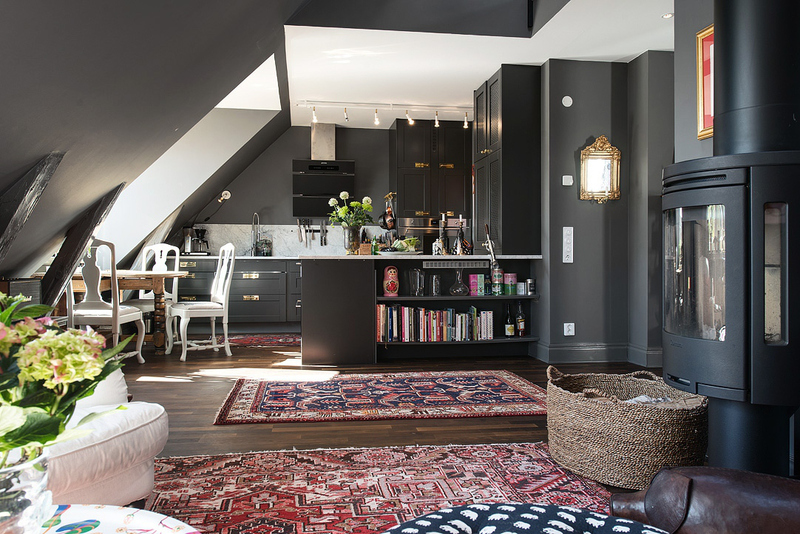 The very deep gray color works, in part, because there is abundant natural light from large dormer windows in the roof. The apartment is a triplex and there are high ceilings, painted white. At night, track lights mounted on the kitchen ceiling, and a variety of task lighting, is available. Like many galley kitchens, there is one wall plus a peninsula. Here, the under sink wall tucks under the strong diagonal roof line. So the large, under mounted sink with high-arc faucet sink lives just inches from the induction cooktop, which handily doubles as a counter top and prep space. Smeg’s cool angled chimney hood (not available in the U.S.) provides an essential cooking vent system. White marble countertops and backsplash keep the look calm and simple. A touch of warmth is left to snappy brass cabinet handles (how I wish I had a source for these). A Smeg oven sits at counter in a triple tier cabinet oven and storage cabinet. The upper tiers of the cabinet must open against a wall where a bright foodie painting is hung. 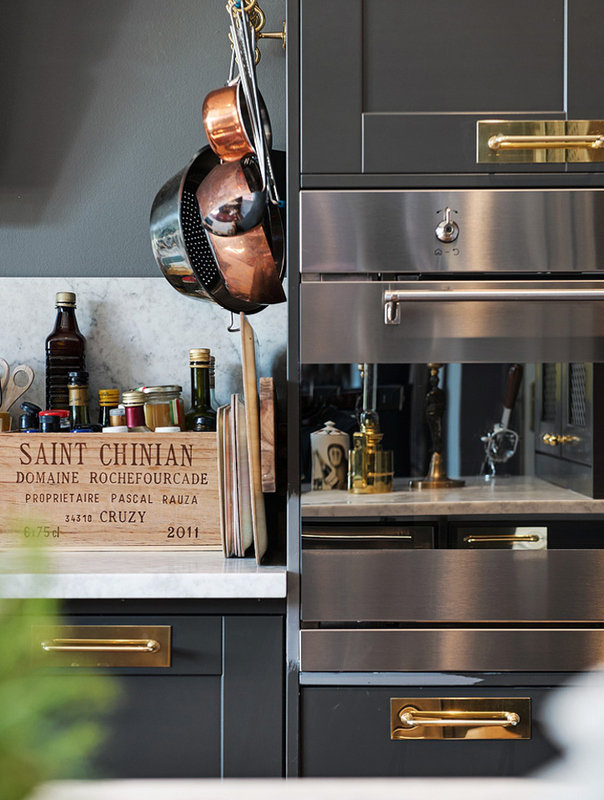 This view shows the location of a garbage pull out to the right of the cooktop, a decorative wine box used as an oil and vinegar caddy, plus a small but beefy brass pot rack hung on the side of the oven cabinet. Across the aisle, a double-height shallow cabinet rests directly on the marble-topped peninsula. The lattice-front double doors offer a bit of discreet decoration. Storage there is accessible from the kitchen and the adjacent living space. With no room for a full-size refrigerator, all refrigeration is contained in the peninsula with a set of fridge drawers opposite the oven. The vent for those is discreet but visible in the top photo in the back of the top book shelf. Smeg’s 60 cm (24-inch) Classic Aesthetic convection oven is small by American standards and little known on this side of the Atlantic. But the high styling offers the kitchen a small helping of bling along with European convection settings and an optional pizza stone. The end of the peninsula — a dead space in many kitchens — works hard here, too. 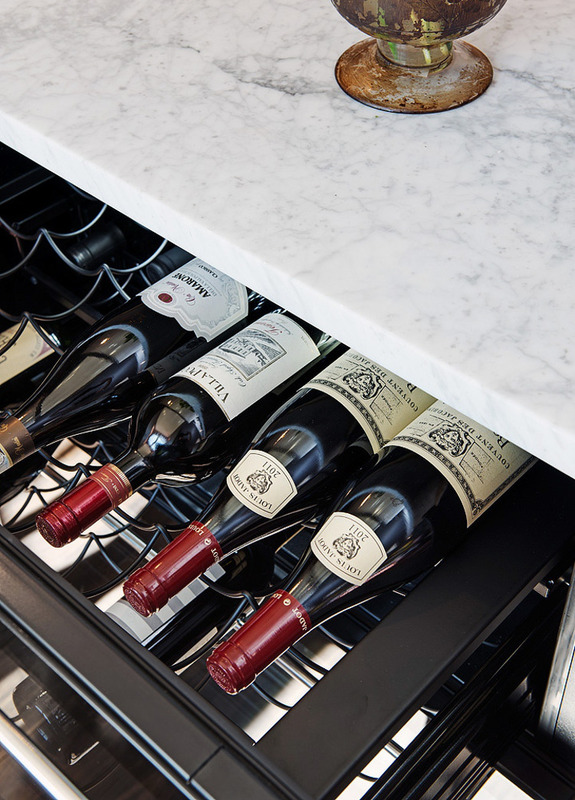 A second under-counter refrigeration unit, with a wine chiller on top, opens into the passageway. That keeps wine accessible to the living area and the pro-style corkscrew mounted on the bookcase side of the peninsula. 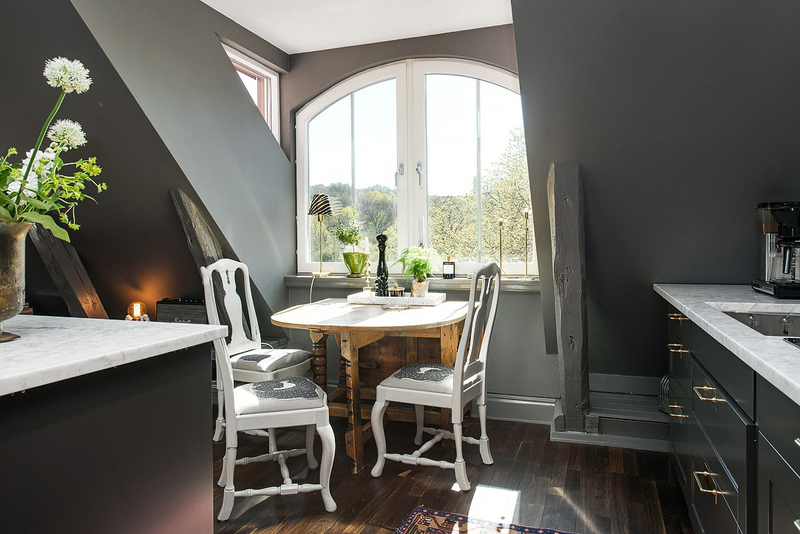 A antique drop-leaf table is backed up against the dormer window which offers a spectacular view at breakfast. Typical Swedish white-painted Baroque style chairs are pulled up around it and easily moved away when needed. This compact apartment kitchen is fully equipped and set up well for a meal for two or for entertaining. Sophisticated color and integration into the whole look of the living space offer a smart, modern approach to contemporary kitchen design. The apartment bathroom, with a unique triangular shower, is featured in my Modern Pink Bathroom post.